Many of you are understandably curious about the research endeavors taking place that could help improve the diagnosis, management and treatment of Parkinson’s disease (PD). APDA is very selective and strategic in our research funding and we are proud to support some of the brightest researchers who are at the forefront of this disease. From time to time, I’d like to introduce you to some of them so you can learn more about the incredible work they are doing, what pushes them to work so hard, and more. Our first interview is with Dr. Giulietta Riboldi, a post-doctoral fellow at the Marlene and Paolo Fresco Institute for Parkinson’s Disease and Movement Disorders at NYU Langone in New York City. Dr. Riboldi is the recipient of one of APDA’s Post-Doctoral Fellowships for the 2018-2019 academic year for her work studying how mutations in a protein called glucocerebrosidase (GBA) lead to the development of PD. As background, GBA is an enzyme that breaks down a large molecule in cells called glucocerebroside. When both copies of the GBA gene are mutated, glucocerebroside accumulates in cells, causing Gaucher’s disease. Mutations in one or both copies of the GBA gene is also a genetic risk factor for the development of PD. However, only a small percentage of people with one GBA mutation develop the disease and it is not yet clear why some people with the mutation develop PD while others do not. Dr. Riboldi’s project investigates whether interactions with other genetic changes are responsible for why GBA mutations contribute to disease in only some people and not others. Q: Why is it important to distinguish between people who carry the GBA mutation who develop PD and those who do not? A: We know that PD is a progressive disorder. When patients manifest the first symptoms of Parkinson’s it means that the degeneration of the dopaminergic neurons in the brain has been ongoing for some time. Unfortunately, when we are a dealing with neuronal cells it is difficult to replace what has already been lost. Thankfully, there are newly emerging treatment approaches that may target specific molecular mechanisms associated with PD, such as the GBA mutation. So far, however, we only know that mutations in the GBA gene increase the risk of developing PD. But most people who carry the mutation will not develop PD and we are currently not able to predict who will develop PD and who will not. With new treatments for PD associated with GBA mutations on the horizon, it would be great to be able to more accurately predict who with the mutation will get the disease. Then the treatments can be given early to those who are most likely to benefit. We are therefore in search of other factors that further increase the risk of PD in people who carry the GBA mutation. Q: How do you perform your studies? Do you take samples from patients? What type of samples do you take and what do you do with the samples? A: Using data collected from our research, we aim to identify biomarkers that can be used to provide early detection of PD in individuals that carry the mutated GBA gene. Subjects who enroll in our study will be asked to participate in specific assessments, including a clinical evaluation, a smell test, and a study of eye movements. Additionally, we are assessing the role of the GBA gene in monocytes. Monocytes, a group of white blood cells, play a vital role in supporting our immune system. A growing number of studies suggest that monocytes may also play a role in the development of PD. To study monocytes, we collect a blood sample from our subjects. The genetic information encoded in the DNA and RNA is extracted from these cells and then analyzed using statistical and informatics tools. We are hoping that these cells, taken from people with and without the GBA mutation, can help us understand what other genetic changes, in conjunction with the GBA mutation, conspire to cause PD. We are also studying brain tissues obtained at autopsy from patients who chose to donate their brains to research, in order to answer these questions. However, you do not have to agree to donate your brain after death in order to participate in other aspects of the study. Q: How do you recruit patients to your study? A: We ask eligible subjects from our Institute if they would like to participate in our study. We also recruit patients who are not treated at our Institute as well. The research assessments are usually performed the same day as the patient’s clinical visit and lasts about one hour. The staff at our center is always available to discuss the study with subjects who are interested in participating or would just like to know more about the research project. In order to be sure that our findings are correct, we must be able to compare them to many different groups of people. We are therefore not just looking for people with PD who carry the GBA mutation. We are also looking for people with PD who do not carry the GBA mutation, people without PD who do carry the GBA mutation, as well as people without PD who do not carry the GBA mutation. A person may know if he or she has a mutation of the GBA gene because of previous genetic tests (for example a prenatal screening) or because he or she is a relative or parent of someone affected with Gaucher’s disease. Q: What if one of our readers wants to participate in your research, would they be able to? A: The research staff at the Fresco Institute is always available to discuss the study with patients or healthy controls who are interested in contributing to our project. I would like to encourage anyone who is interested in participating in our study to contact our research team at the Fresco Institute at NYU via phone at 646.501.4367. Q: Are there any findings yet that you can share with us? A: We are still in a very preliminary phase of the study. However, we should have some initial results soon. It is encouraging that other researchers are coming to the same conclusions that we are – that monocytes may help us understand the mechanisms underlying Parkinson’s disease. Our team is excited and confident about the great potential impact that our research may have on the PD community. Q: What fuels your passion for your research? A: There are two main drivers of my work as a doctor and a research scientist. First is curiosity for understanding disease – why it develops, how it manifests, and what may be done to provide treatment and care. I know that there are answers out there that just need to be discovered. Second is the continuous support and encouragement that I receive from my patients. This reminds me why medical research is important and keeps me focused on doing my part in the care and potential cure of PD. APDA is proud to fund a myriad of research endeavors. Read more about all of the current research APDA is funding. From time to time, A Closer Look will profile one of our researchers so that you can learn even more about the exciting research that APDA funds. 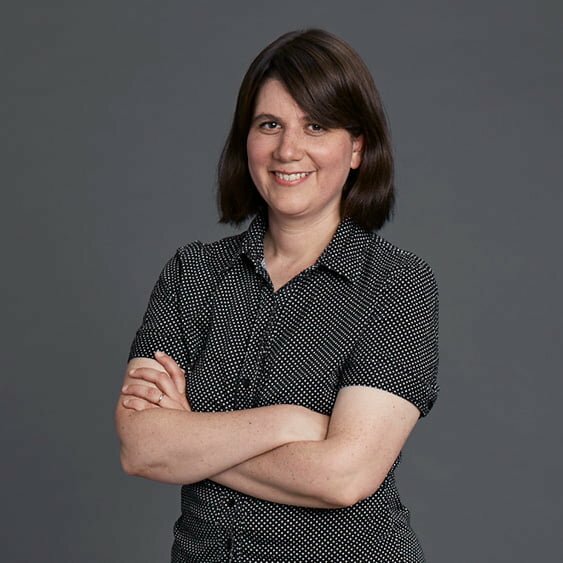 Giulietta Riboldi, one of APDA’s 2018-2019 post-doctoral fellows, is studying how mutations in the GBA gene may lead to the development of PD.